Auerbach Glasow French has been acknowledged by the International Association of Lighting Designers (IALD) with an Award of Merit in the Monumental Structures/Public Spaces category for its work on the renovation of the Salon Doré from the Hôtel de La Trémoille at the California Palace of the Legion of Honor. The IALD awards program recognizes excellence in lighting design; this project was selected from among 206 entries. Auerbach Glasow French renovated the Salon Doré from the Hôtel de La Trémoille at the California Palace of the Legion of Honor.Salon Doré is one of the finest examples of French Neoclassical interior architecture in the United States. 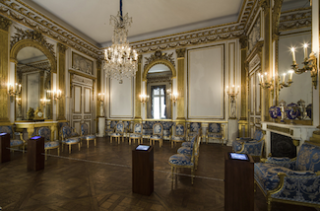 The intent of the Salon Doré restoration was to return the room to its 18th century grandeur including lighting of the era. An historic chandelier, wall sconces, torchieres, and the gray twilight of Paris through the windows are the only discernible light sources in the room. The apparent simplicity of the design veils a complex lighting system that complements the richly gilded and carved reception salon from the reign of Louis XVI. This room has been relocated eight times including its most recent renovation. It took an extensive team of curators, conservators, designers, and architects 18 months to restore it.